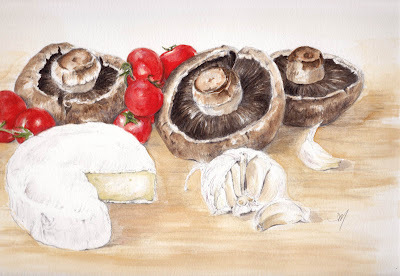 Couldn't decide what to draw today, so here's a view of what was on the chopping board ......Camembert, portabello mushrooms, garlic, tomatoes..now under the grill.......and washed down with a cold glass of Chardonnay. I've had problems scanning this, I think because the red has been done with Chinese watercolours and the rest with European...could it be the different densities of the paints? Thanks interesting but i expect they are all different if they are made in different countries where even water is different. Well I think you managed very well in the end, because this looks gorgeous! I always have trouble scanning watercolours so I'm afraid I can't give you any advice on this one. Hope you had a great dinner with these ingredients! Great menu, and of course painted marvelously ! Now I am hungry. This is deliciously beautiful! Sometimes I get an almost perfect scan of a work and other times I can't get it color corrected no matter what I try. I have found that sitting a strip of paper with a full spectrum of color swatches on the scanning bed along with my art somehow helps the scanner "see" the colors better though.